US futures are pointing to a lower open today after ending higher on Thursday. Traders remained cautious ahead of jobs and wage-growth data. Also, North Korea’s offer to halt nuclear and missile test has added momentum to the investors. The S&P futures slipped 0.07% to 2,737.25, Dow futures gained 0.02% to 24,896 and Nasdaq slid 0.01% to 6,973.25. Elsewhere, shares at Asian markets closed mostly higher on Friday, while European stocks are trading higher. On the European economic front, data from Insee showed that France’s industrial production fell 2% on month in January after rising 0.2% in December. The Office for National Statistics data revealed that industrial output in the UK rose 1.3% on month in January after falling 1.3% in December. The data from Istat showed that Italy’s producer price inflation slowed to 1.7% in January from 2% in December. The statistical office INE data revealed that Spain’s industrial production rose 1.2% on year in January after rising 5.8% in December. The National Institute of Economic and Social Research stated that the UK economy is likely to grow at a slower pace in the February quarter. On the Asian economic front, data from the National Bureau of Statistics showed that China’s consumer prices increased 2.9% on year in February after rising 1.5% in January. The Bank of Japan kept its monetary policy unchanged as the country’s economy is likely to continue its moderate expansion. 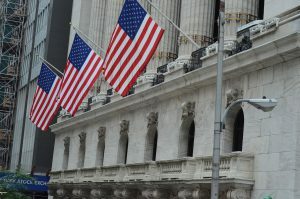 On March 8, US ended higher, with Nasdaq up 0.4% to 7,427.95. Dow gained 0.4% to 24,895.21, and S&P 500 advanced 0.5% to 2,738.97. President Donald Trump has confirmed the proposed imports tariffs of 25% on steel and 10% on aluminum. Trump suggested countries such as Canada, Mexico and Australia could be exempted from tariffs. Meanwhile, key economic data that will be released today include the Labor Department’s employment situation report, the Commerce Department’s wholesale trade report, and Baker-Hughes weekly rig count. Chicago Federal Reserve Bank President Charles Evans will be giving speech about the current economic conditions and monetary policy. Boston Fed President Eric Rosengren will also be giving speech today. On the corporate front, Big Lots stock plunged 10.41% in the premarket after a surprise drop in same-store sales. The company is also expecting a weak profit for the year and current quarter. Insys Therapeutics stock tumbled 10.69% in premarket after posting disappointing sales for its opioid cancer pain killer Subsys. Big Lots stock plunged 10.41% in the premarket after a surprise drop in same-store sales. The company is also expecting a weak profit for the year and current quarter. Finisar stock fell 11.03% in the premarket after weak guidance and downbeat third quarter results. Dana stock rose 0.80% in the premarket after agreeing to merge with GKN Driveline division in a deal valued at about $6.1 billion, including debt. United Natural Foods stock increased 7.68% in premarket after better-than-expected second-quarter earnings. On the earnings front, UTStarcom Holdings, Big Lots, and Overseas Shipholding Group are the key companies due to release their earnings today. Crude oil futures is up 0.75% to $60.57. Gold is trading down 0.32% to $1,317.50, and silver is down 0.30% to $16.45. On the currency front, the US dollar is trading up 0.50% at 106.821 yen. Against the euro, the dollar is down 0.10% to $1.23. Against the pound, the dollar is up 0.20% to $1.3842.